At the turn of last year Apple made an unprecedented move: a new product got announced long before its actual release date. What is par for the course for majority of manufacturers of household appliances and personal electronics was all another way for Apple to stir up the market with a palpable sense of expectation for its very fetching and in a way innovative solution. Incidentally, the same approach is now being effectively used for the iPhone – properly prompted flurry around it has saved the company about 400 million dollars of advertising money. But let us skip over long digressions from the core of this article. 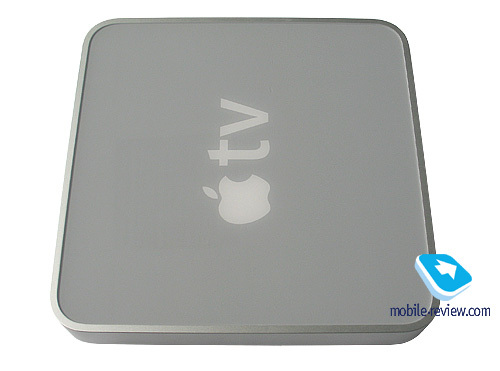 The product that broke the tradition of inaugurating new models a couple of days prior to the official release, was, initially known as iTV but ended up with a more definite name, Apple TV. The sole reason I call it “a device” is because I can’t see how I could characterize its functionality and field of use in two words. 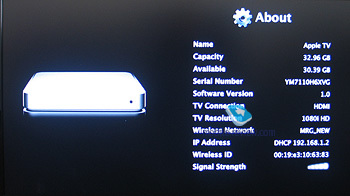 It is a TV attachment, multimedia-file-server, wireless video-audio-photo-player packing Internet-content browser. That’s about it. In practice this device is a small-sized squat box with Apple logo on the top and a sole LED mounted on the front fascia. Other visible sides are free of any elements. Inside, this box has not particularly big 40 Gb hard drive, fast wireless adapter and audio-video-outs for nearly every life occasion. By the looks of it, everything is utterly simple, nothing to wonder about, however Apple, that had surprised the whole world with more than one unsophisticated-looking device – remember the first iMac or even long in the tooth iPod – made no wrong betting on the Apple TV. But, first things first. Despite the fact that in the US the device hit the shelves late in February and made it to Europe a month later, neither Russian nor Eastern Europe have Apple TV in stock, which are expected to get here by the end of spring – beginning of summer. We managed to get our hands on practically the only unit that came not alone, but in one package with other novelties, this time around by Samsung and more importantly not yet introduced. Therefore we would be better off describing it as a huge Samsung’s plasma TV with support of Full HD resolution, in other words, 1920x1080 pixels. Finally, the picture seemed complete with a Mac Book Pro notebook, that rounded out the list of platforms presented for the test – a desktop PC and a pair of PC-laptops were on it as well. As I delve deeper into the review, I am going to say some more words about the plasma panel, unquestionably outstanding device and the notebook that thrilled our editorial staff with bright display and metal casing. 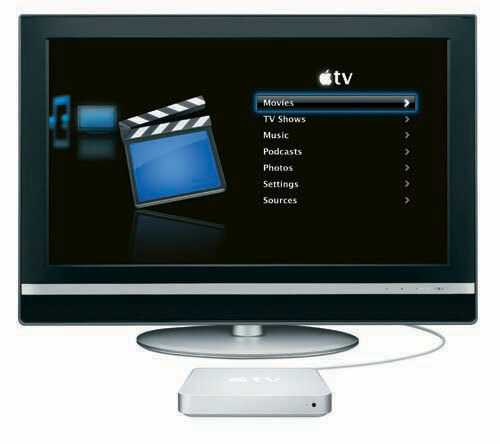 What is Apple TV for? Briefly speaking, with its help you can watch video, photos and listen to music. Any widescreen TV (regardless of type) will do as a monitor, while sound can be transferred to any audio system, ranging from the TV’s loudspeakers to a set of eight speakers and a receiver. 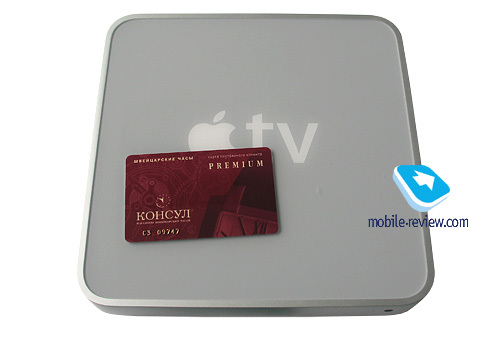 Multimedia content for viewing is added through various ways – Apple TV’s trait is the inbuilt 802.11n wireless adapter, theoretically capable of transferring data at 250 Mb/s (in real-life it tops out at speeds lower than that, but anyway it is several times faster than 802.11a/b/g.). Apple TV has no claims for the role of a hot spot, via the adapter it connecter to the available wireless network for access to the Internet or, which is even more exciting, any PC within its coverage. This PC, be it a desktop or a notebook, PC or Mac, should have iTunes version 7 with Apple TV support installed. If all these conditions are observed and you have made everything right, it is possible to view multimedia content stored on the PC on your TV screen. As you would expect, such content should be available in iTunes. On top of that, it is not a big deal to guess that video clips for Apple TV will be easier to get with iTunes, as well as music, though. However, in Russia this probably won’t be the case, although watching and downloading theatrical trailers is free of charge. But we will get back to this in the following chapters. When creating Apple TV, the company’s designers apparently had the device’s place in mind – on a rack with other gadgets somewhere close to the TV set. 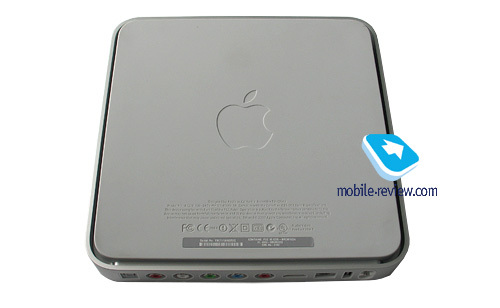 That is why the appearance of Apple TV got no-extras, yet having its own appeal, touch that is so Apple. It is good to know that launching a completely new type of device the company focuses on keeping it in line with other Apple-styled devices design-wise. Seemingly, in order to spotlight that even more, they placed the company’s logo, which is the famous apple with a piece bitten off, on the top plate. The casing itself comes in at about 3 cm deep (to be more precise, 2,8 cm), which makes it look like a book, or, speaking of electronic devices, a notebook (the logo on top only strengthens this feel). The material used here is Apple’s trademark matte plastic applied in Mac Books of the previous generation. 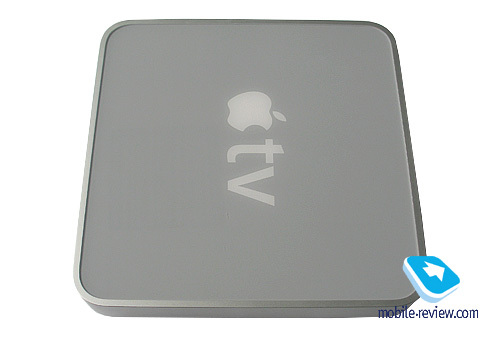 Nevertheless with Apple TV the company has stepped away from its milky-white credo – the top panel has blue-gray color, while the spines are finished in silver. The build quality is nothing we would have gripes with – since Apple TV is more likely to be put next to top-notch audio-video devices, this aspect is one of the big focuses here, just like in any other product by Apple, though. The front fascia got armed with Infrared recipient that works only with the native six-button Apple Remote control, there is no way for transferring any data through it. Next to the Infrared sits the LED indicating current state of the device. As you see, Apple TV employs minimalist design, being more of a “thing in itself” – it interacts with the outside world wirelessly, thus there is no need in front-mounted jacks, which even ultra-pricey Hi-Fi gadgets manufacturers don’t shrink from. In return, your mouth is going to start watering, after you take a look at Apple TV’s back panel, as it accommodates HDMI-out (video and audio), Ethernet and USB sockets, analog RCA audio-out, optical audio-out and a component video-out. Those who, much like me, have already got curious by the USB port, are going to get disappointed, for as of today it serves only for service purposes, without allowing you to plug in a 500 Gb hard drive to Apple TV. Though, in order not to beam those huge HDTV video files over the air, you can connect the device to a 100 Mbit Ethernet router, even though I have rightful doubt about miles speedier data transfer in this case. More on this in the section devoted to our quality time with the device. I have already mentioned the design in passing, though I feel confident enough to say some more words. When I first saw a photo of still not renamed iTV, frankly, I came away not very impressed. I even had thoughts that the apple on top the top plate didn’t lend the device a hundred percent Apple feel. 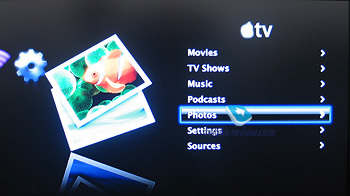 Basically, as of today not much has changed – Apple TV doesn’t leave a solid impression in the photos. But in the flesh, although it is a rarity for hardware, it looks totally different. You finally get to feel how thin it is, find out its no-nonsense look, absence of any details that would grab your eyes, apart from the apple. The color scheme of Apple TV finely blends with apartment’s interior, specifically the hardware rack, however for this they didn’t have to forgo any widely known Apple traits. All in all, the company has hit the bulls-eye with its Apple TV once again. By the way, its looks somehow reminded me of the old Apple Cube computers – probably with its blue-tinted gray color. Though, I would really love to see a black variation with highlighted apple – some suppose it would look quite interesting. The only way for managing Apple TV is multipurpose infrared remote control – it will also do for managing the company’s PCs, iPod Hi-Fi audio system and tons of other devices. Even though I already gave it a close-up in one of the previous reviews, I will devote some words to it here as well. Those who have never had iPod experience (since the remote’s control scheme is partly ripped from there) before will need some time to come to grips with it. The Apple Remote retains six (!) buttons in sum: play/pause, doubling as OK, menu, four-position circle “up-down-left-right”. All keys will turn out to sit right under your thumb, having the most fitting, to me, size, travel and feedback, which is actually the reason to praise the remote. 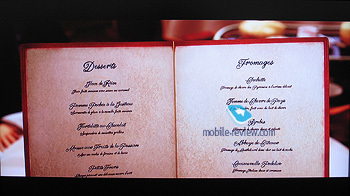 However not everybody likes it – many think that for entering and exiting menu items, left and right arrows would do better, rather than Play for calling up menu and Menu for getting one level up. Nevertheless, it will make people who have already mastered iPod’s controls cheer, which is quite expected. The remote is immediately responsive, the system instantly reacts to every press, also, I feel like making a note here, even though the section’s title doesn’t allow me to do that – smooth icon animation, which is almost perfect, all thanks to Intel’s CPU and powerful graphics processor Nvidia GoForce 7300 found in the Apple TV..
Other amenities include progressive fast-forward and lists browsing – if you tap and hold the remote’s button the system increasingly speeds up when skipping through movies or navigating in a list. Though, when doing this is a movie you will need to press the Play button to stop rewinding and resume playback, instead of releasing the key, which is not always convenient. On the whole, system management, navigation, and setting up of various aspects are very straightforward and get even easier with a good remote. But to make sure that my reflexes haven’t grown completely into iPod’s controls, I gave the remote to a girl that had never had an iPod or heard of Apple TV before. In less than a minute she was soaring through all modes and had no problems with switching from movies to photos, from there to music, picking the titles she needed along the way. You could accuse me of being too faithful to the products from California, but so far, I haven’t seen more rapid process of mastering pretty sophisticated gadget. 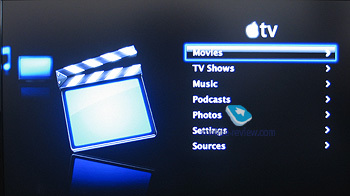 The main, as well as the rest of the menus found in Apple TV utilize the way proven by five previous iPod generations: all items are shown as text lines arranged in a list. In case with Apple TV these are nothing more but captions to big colorful thumbnails coming from the depths of the display to replace the previous item. Regrettable all menus and lists are not cyclic, meaning that having reached the end you will have nothing to do but go all the way up again. 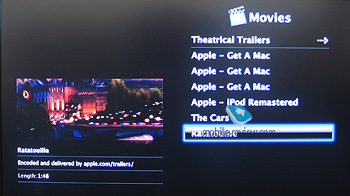 The menu comprises the following items: Movies, TV Shows, Music, Podcasts, Photos, Settings Sources. Support for Russian language is implemented by default, and just like in all players it leaves nothing to be desired. Movies, TV Shows, Music, Podcasts, Photos. 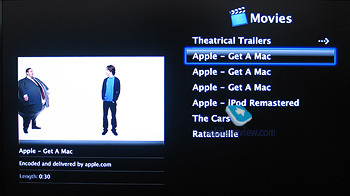 Selecting any of these items brings up the list of available movies, shows, tracks, podcasts and photos respectively and some extras as well – for example in Movies you will also find links to the most popular iTunes movies (iTunes Top Movies), and the list of trailers (Theatrical Trailers). All this can be watched if your Apple TV is connected to the Web. 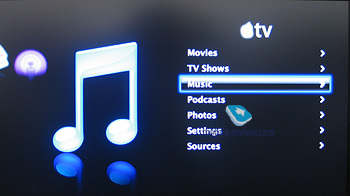 Then, TV Shows feature like to iTunes Top TV Episodes; Music – links to the most popular clips and tracks, Shuffle option and so-familiar options for sorting the media library by artist, album, track title or genre. Audio-books and playlists are stored here as well. The section for Podcasts includes lists of uploaded on PC podcasts the user of the iTunes library is subscribed to. 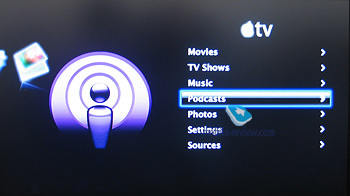 Though you can throw new podcasts onto the list from the Apple TV – a visit to iTunes is required. Settings. As always, this is the biggest menu item of almost any device that actually has it. In its turn, Apple TV provides you with 13 options. Listing the all won’t make much sense; therefore we will rather tell you what they are meant for. Specifically, in this menu you can check device information, select display resolution, set up network, choose screensaver and repeat mode. 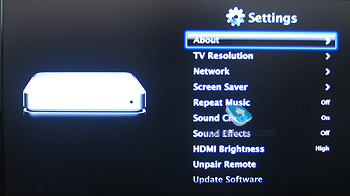 From here you can also enable Sound Check mode and sound effects, adjust HDMI brightness, disable remote control (to connect a new one), update firmware, pick one of two dozens of menu languages. Finally, you can view Apple’s official information and reset all settings to default. Source. Serves for switching signal sources between Apple TV and external iTunes libraries, connected wirelessly. Writing that the menu in a cinch to use would mean repeating my own words I said about iPod Mini which was my very first iPod. 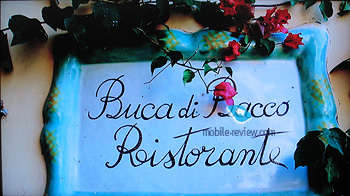 In spite of the increased number of settings, the simplicity and plain layout have remained unchanged – the menu structure is mastered in no time even by those who come to see it for the first time. The credit again goes to Apple’s interface designers. Apple TV is nothing special when it comes to power: a standard power cord is plugged in the jack on the casing, meaning that the power unit is somewhere inside. By the way, that’s the reason why Apple TV noticeably heats up when on, but keeps it quiet since its temperature doesn’t exceed that of an average notebook. It is worth mentioning that should you lose the power cord, you won’t need to call at the nearest service centre to get a replacement, since it is a standard cable. One of Apple TV’s major appeals, which it actually builds on – embedded wireless adapter, 802.11n, whose top speed is around five times greater than 802.11g, meaning that in theory Apple TV can get data at 200 Mbit/s. Connection to network is utterly simplified and runs smoothly – all you’ve got to do is enter the key, afterwards Apple TV will connect to the network automatically without any notifications. Hooking up with up to five external content sources is also straightforward. In case there are more than five PCs with installed iTunes (version 7.1 or newer) within Apple TV’s range, you can also disconnect from one and link up with the other – thankfully this process takes very little time. Everything looks as follows: in “Sources” menu you select “Connect to other iTunes”, the system carries out a quick search and display a five-digit code, which should be punched in when you open Apple TV tab in iTunes. Then it synchronizes with iTunes and afterwards automatically connects to the PC, if it’s on. 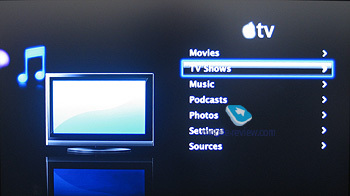 If you happen to connect to various Apple TVs, for example, when visiting friends to show off your latest snaps, then in iTunes it is very easy to disconnect from one device and hook up with another. Wrapping it all up, I should say that the simplicity of how Apple TV connects to wireless networks and external sources has pretty much impressed me. Of course, I have heard many times that on Mac’s many issues are solved in a less sophisticated way than on PCs, though I didn’t believe those stories until I tried it myself. Then, of course, I had numerous opportunities to try out all these processes in real-life and came to the conclusion that in 99% of cases needless details ended up hidden from the user – this holds true for Apple as well. I should draw our attention to a substantial fact outright – Apple TV woks only with widescreen TVs (flat or CRT). There is a good chance that the idea of this product emerged in the company several years ago, but back then such tellies were not widespread enough. Though these days a decent HD-ready TV with support for 720p resolution will cost you less than a thousand, which people across the globe take advantage of. 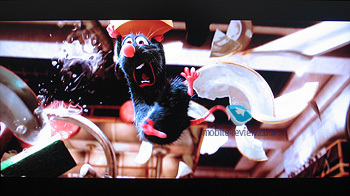 HDMI-out makes for best possible picture without having to re-encode the video, and this is what we used in our tests. 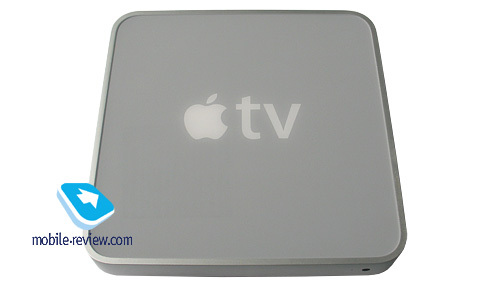 Now some words about the telly we tried out the Apple TV with. The sample was handed for a test in a complete package, so as to prevent the reviewers from missing bits of the innovative experience because of no decent plasma panel at hand. 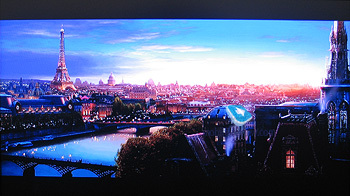 And I was no exception, receiving an incredible 40-inch “plasma” from Samsung. However this device is still trying to make it through test-sample stage; out of respect for Samsung’s secrets I will not disclose the model’s name, whose announcement is scheduled for mid summer, even though all labels were already put on the shell. 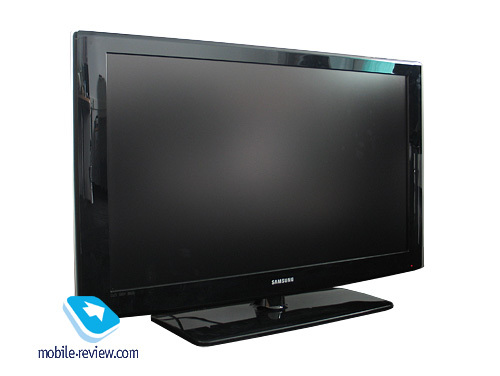 The plasma display’s casing is made of black glossy plastic and gets into the spotlight in no time. As regards its design, there was an unprecedented case, when all my colleagues agreed that it was, if not brilliant, but very good, which was something I could not recall. The fact is, the display has no unnecessary things on it, and its front fascia houses only the screen itself, Samsung’s label, and a small ornamental plate glowing in soft blue. The controls are mounted on the top spine’s right side and can’t be spotted when looking at the front. The same goes for the audio system, which is placed at the bottom of the rear plate. Maybe, I hadn’t had enough experience with such top-notch and, make no doubt about that, expensive devices, but I was pleasantly surprised by the sound produced by the default speakers – at full blast they easily filled a quite large room with deep bass-filled sound with sharp highs. Also, take note that both music and video were beamed from my notebook, which I’m writing these lines on at the moment, so the whole picture looked pretty much impressive. By the way, the system’s performance can’t be affected even by heavy data transfers – pauses for content uploads are a thing of the past with it. This indicates well-made and harmonized software interactions between iTunes and Apple TV – even I, taken over by hatred for occasional slow-downs in iTunes, had to admit that in the end. But let us get back to the plasma panel. Its rear sports a whole array of all kinds of jacks – HDMI alone numbers three slots. However for some reasons the telly doesn’t receive audio signal through HDMI, so we had to connect Apple TV via standard RCA-cables, that came included in the package. In fact they were not exactly “standard”, being almost a finger thick and produced by the “court” company - XtremeMac. We should note a very sad fact, though – you won’t be able to use the Apple TV right after taking it out of the box, as it comes with no, even the most basic, interface cables. It seems they think that video-conscious users put cables above all else and won’t turn to default units whatever they are. With the plasma packing this much of features and buttons-loaded remote control, pairing it up with Apple TV was everything but a pain – there is no chance you would plug the HDMI cord in a wrong socket, and the RCA jacks you need are marked with labels and corresponding colors. All in all, looking at Samsung’s plasma display, I fell into dreams of a day when such pearls will be available to any working man, or when Mobile Review staff’s income will multiply up many times. The issue of connectivity or complicated process of picking the right jack didn’t interfere with the dreams. The hard drive Apple TV comes with is, let’s be honest, really small by contemporary standards, carrying only 40 Gb onboard. On the other hand, downloading this much of content will prove to be quite a challenge, and what is more, Apple TV chiefly focuses on interaction with external sources. Since it lacks any slow-downs when it comes to wireless connectivity, you can readily forget about the inbuilt storage, and keep throwing movies, music and photos on your desktop with 500 Gb hard drive (which doesn’t look like something out of this world today). As you would expect from it, Apple TV’s hard drive keeps low profile when operating – neither noises nor vibrations. At last, we made it to the most interesting part – how it feels to watch videos with Apple TV. I can already feel your excitement and thus squeeze it in two words – really good. Basically, this is the device which gave me the experience of watching high-resolution video, that was not limited to the manufacturer’s headquarters. For the purposes of viewing photos Apple TV supports full-fledged Full HD 1080i, however for video it tops out at 720p, in other words at a resolution of 1280 x 720 with progressive scan. Though, many experts claim that video with interlaced scan even at higher resolutions is less pleasant to watch. I still can’t confirm or deny that, firstly because I haven’t had enough experience with HD-video. 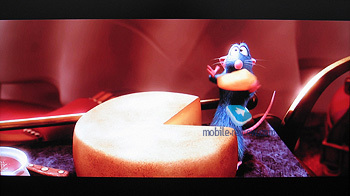 Nevertheless, watching HD video clips at 720p on a huge bright display leaves an indelible impression – I’m afraid the photos won’t give you a complete idea of how many tiny details are there, or tell you about the ability to read the menu in “Ratatouille” trailer. When loading from the internal hard drive, Apple TV starts playback instantly, though it takes it a mere 3-5 seconds to upload a 160 Mb big clips from an external source. 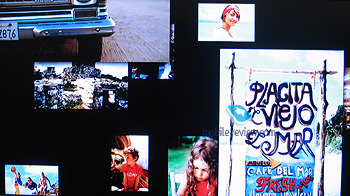 Video clips that you download from Web are processed pretty fast as well, though it all depends on your Internet connection speed. I suppose 1 Mbit would be enough for watching trailers and shows without any lags or freeze-ups. All videos are played back smoothly and this is not what we’d complain about – by the looks of it, they don’t differ from what you get from a quality DVD and a good video player. Like we mentioned above, Apple TV has progressive fast-forward feature onboard, which considerably reduces the time you spend on locating the desired scene, say, in the middle of a movie. At first, though, you might end up skipping forward too fast and thus loosing control over the process. 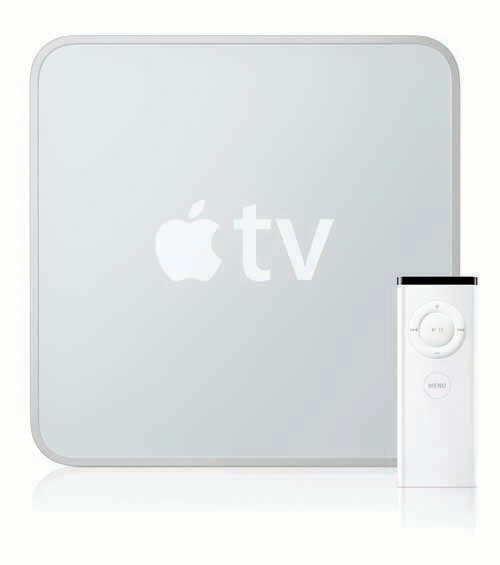 Apple TV supports video stored in the following formats: H.264, up to 5 Mbps, maximum resolution: 1280 by 720 pixels at 24 fps, 960 by 540 pixels at 30 fps in m4v, .mp4 and .mov respectively; MPEG-4 up to 3 Mbps, maximum resolution: 720 by 432 pixels at 30 fps in the extensions mentioned above. Apparently, many HD-video files you’ll get your hands on will require recoding, but it’s worth the trouble. Officially, Apple doesn’t give exact specifications of the installed chips. However, the Web has it that the system owes its smooth operation and High Definition support to 1 GHz CPU Dothan from Intel and Nvidia’s 64 Mb graphics processor. If you ever viewed photos on an Apple-branded computer, then you definitely could not overlook “Ken Burns’s effect”. Briefly speaking, with this applied, the photo gently moves horizontally and vertically, which lends it the feeling of motion. 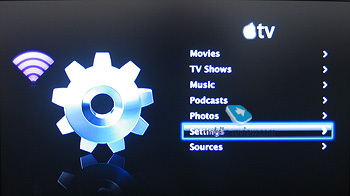 This feature is used in Apple TV, though it can be switched off on demand. Also there are all standard features available, such as adjustable time between slides, background music, random selection of photos and music. Moreover, you can choose between 13 types of transition or enabled random choice. This looks very alluring, as most manufacturers devote little attention to transition effects – though Archos arms its products with somewhat similar solutions. 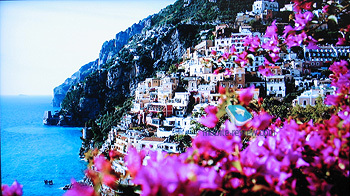 Viewing photos with Apple TV is a true joy, though we shouldn’t underestimate the effect of a top-notch TV’s display. Anyway, I haven’t come across a bad picture on widescreen TVs yet, and the diagonal, that PCs will never match, contributes to the overall comfort. Music playback is implemented in the same way as on iPods – everything is quite straightforward and convenient. 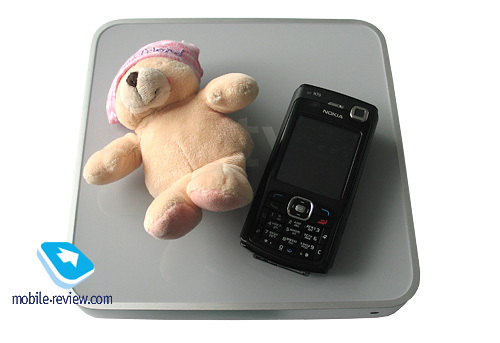 The sound quality of the device is very competent – at the end of the day, it is not an MP3-player. Though, it shares some traits with it – in end, it is all up to you and the headphones, or, in Apple TV’s case, audio system you plug in. Generous selection of sockets on the back panel enables you to connect Apple TV to a good receiver and simply make it a part of your home theater. In spite of being unsophisticated both outside and inside (wireless adapter, a handful of chips and a hard drive) Apple TV is a device, like all others that if haven’t turned the world upside down, changed it in some way, employing a sole yet very promising concept. It would seem, the idea of transmitting video from PC to TV is on the surface, and in fact Apple is by no means the first company looking into it. But ultimately the winner is not the one who picks up an idea that is only about to take its final shape, but the one who implements it in a more convenient and profitable way. And Apple here is second to none – at the end of the day, MP3-players were invented not in California, but look at the market and sales today. The same might hold true for Apple TV – the fact of the matter is that most of ordinary PC owns don’t even have an idea where they could get movies, that are piled on hard drives of a good half of PCs in Russia. Actually no other country in the world has such excessively content-rich local area networks. 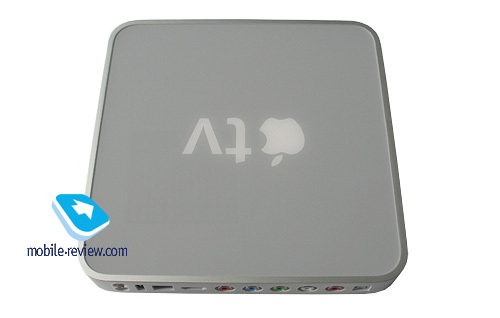 And in the form of Apple TV the company offered not only a device for playing back multimedia content, but also the content itself – the most powerful marketing leverage of Apple TV is famous across the civilized part of the globe, iTunes. Further more, the reputation and fame of the “apple corporation” will play substantial roles, but above all these things are simplicity and ease-of-use of the device. So, to put it simply, Apple TV is a 300-dollar all-in-one tidy entertainment source, saving for, maybe, video games. As always, it is hard to tell how popular it will be in Russia, though some time ago iPod was somewhere at the bottom of the sales charts here. Personally, I wouldn’t mind bringing one to my room, although, after a widescreen TV. Supported formats: H.264, up to 5 Mbps, maximum resolution: 1280 by 720 pixels at 24 fps, 960 by 540 pixels at 30 fps. 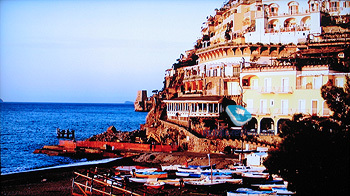 MPEG-4 up to 3 Mbps, maximum resolution: 720 by 432 pixels at 30 fps; m4v, .mp4 and .mov.